The Arizona Highways Photography Guide: How & Where to Make Great Photographs (“The Guide“) is a new book from the editors and contributors of Arizona Highways. The Guide is divided up into three main sections: (1) The Basics, (2) Types of Photography, and (3) Places for Photography. While the book benefits from cameras and pens of a number of authors and photographers, it suffers from this collaboration as well. The Guide tries to do too much. I never got into the “flow” while reading The Guide. You know what the “flow” is right? When you’re reading a book that you just can’t put down or working on something that you can’t stop for a break. Time passes so fast . . . you’re in the zone, the flow, etc. There’s some good info in The Basics section; however, there is also too much info. At first, I thought the book was geared toward complete beginners that had never touched a digital camera before because of the elementary discussions that define sensors, pixels and LCD screens. However, after turning a few more pages, The Guide delves too deep into sensor sizes, ISOs and other, more advanced concepts without an appropriate transition. Unfortunately, it just didn’t come together. Jump to page 66, Exposure, in The Basics section and The Guide starts to pick up quality, pace and consistency. Given the tone of the rest of the book, this is where it should have started. If you are looking to learn more about creatively using your camera, then the rest of the book does a pretty good job of pushing your knowledge and expectations to the next level. Particularly, the chapters on Light and Composition offer an excellent discussion of these concepts. 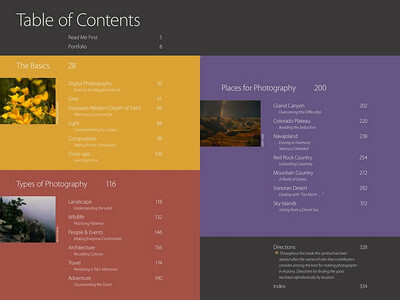 The section on Types of Photography continues on the foundations laid out in The Basics section. Again, you get the insights from several different photographers with a variety writing styles and photographic examples. For the most part, the Types of Photography section does a good job of introducing and offering tips for the different topics covered. The Places for Photography sections is really what makes the book worthwhile. The rest of the book just feels like an introduction (or, perhaps, filler) for the Places for Photography section. Reading some of the photographers’ experiences of shooting in a variety of Arizona locations really makes me want to go there and take some photos. The stories of shooting the Grand Canyon are really inspiring. I never really thought about the lengths that some of the landscape and wildlife photographers go through in order to get “the shot.” Kudos to you guys! Hiking pre-dawn for several consecutive days for just the right light in the perfect sunrise or sunset? Long hikes for miles upon miles to get a shot of some place that no one has photographed (or “successfully” photographed) before? I’m glad somebody gets those shots. If this kind of stuff floats your boat, then you’ll dig the Places for Photography section of The Guide. Note, you’ll also find some of these great stories in the Types of Photography section. The Places for Photography section is the best part of the book and, unfortunately, there’s just not enough of it in The Guide. As I said before, I never got to the point while reading the book that I just couldn’t put it down. Sadly, there were some parts that I just had to force myself through. I just think that the book tries to do more than it should. Most of The Basics section could be skipped over . . . unless you need to know things like what an LCD is. When I read what I consider the meat of the book (Places for Photography), The Basics section seems very unfitting for The Guide. These are two polar opposite audiences. Someone who is hiking to the middle of nowhere to get one great photograph does not need the primer on photography that The Basics sections tries to give. The photos throughout The Guide are phenomenal. Arizona is truly depicted as one of the most beautiful places on Earth. I think The Guide could have been a great coffee table book. Unfortunately, it’s physical size is too small. I would have loved to see some larger photos in a big hardback. Likewise, if Arizona Highways Photography Guide had just sought to be what the title implies, it could have been a great book. Unfortunately, the meandering range of topics that speak to a variety of audiences will likely bore many advanced photographers and stupify beginners. For me, The Guide had some great potential, but simply missed the mark by trying to do too much. In sum, I certainly learned a few things in reading this book. If you’re heading to Arizona or are interested in the photography of Arizona Highways’ contributors, then you should pick up a copy. For the price, it’s also worthwhile to read some cool stories from veteran photographers that have battled the Grand Canyon on long hikes and raging rapids. If you need a book to help you develop your skills as an amateur photographer, skip this one and pick up Understanding Exposure by Bryan Peterson instead. If you’re interested in picking up a copy of Arizona Highways Photography Guide, you can find it at Arizona Highways or Amazon.com.